Crispy, buttery grilled cheese sandwiches. Chips and dip. Tater tots smothered in cheese, sour cream, bacon and scallions. Macaroni and cheese with beef gravy and cheese curds. Look no further for your ideal cheat-day meal. Fans of the popular Whey Station truck now have a permanent spot for their fromage fix. Jillian and Josh Moskites, the married couple who first launched the truck in 2011, recently opened their first brick and mortar restaurant on Middletown’s Main Street in late January. Their new grilled cheese emporium, Whey Station(ary), takes the place of the former Keagan’s Irish Pub. The restaurant is the next step for the couple’s booming mobile business, and its Middletown address is a natural home for Whey Station, which has a loyal following among Wesleyan University students. Over the past eight years, they’ve established their brand by slinging creative sandwiches at events across the state: farmers’ markets, food truck festivals, beer fests, summer concerts at Hartford’s Xfinity Theatre and plenty of private catering. Jillian even won the 2018 season of Food Network’s “Chopped,” to the delight of her six children. THE ATMOSPHERE: The 49-seat space features orange walls, exposed brick, colorful metal chairs and offbeat artwork, like a series of framed drawings of famous figures (David Bowie, Nick Cave, Buffalo Bill) as narwhals. FEATURED/NOTEWORTHY DISHES: The menu is a pumped-up version of Whey Station’s truck specialties, with many new additions. 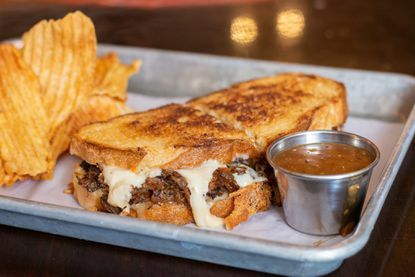 The focus is naturally on its signature grilled cheese sandwiches, divided into “Fun” and “Fancy” categories, and tater tots ($6 to $9) loaded with toppings like cheese sauce and bacon, guacamole, cheese curds, gravy and even truffle zest. The full kitchen allows for more experimentation, and gives Jillian a chance to flex her knowledge of cheeses and gourmet foods. Baked macaroni and cheese ($8) starts with housemade cheese sauce and features customization options like short rib, French onions, buffalo chicken and a veggie medley of broccoli rabe, roasted red peppers and roasted garlic ($10 to $13.) A “cheat day” mac and cheese ($12) goes all out with taleggio and raclette cheeses and a crunchy pork rind topping. Raclette, a European delicacy, is among the more decadent and eye-catching menu offerings. At Whey Station(ary), they use a special machine to heat the surface of a half-wheel of the Swiss cheese until it’s browned, bubbly and oozy. In a tableside presentation, the melty cheese is scraped from the wheel onto a pile of fried fingerling potatoes or tater tots tossed with garlic and herbs. Add-ons like charcuterie, broccoli rabe or Brussels sprouts are $4 to $8 extra. Raclette, a European delicacy, is among the more decadent and eye-catching menu offerings at Whey Station(ary). Shareables and apps ($4.50 to $9) include snacks like housemade potato chips with dip (bacon jalapeño, French onion and a rotating special); spinach artichoke dip with toasted garlic bread points, “bruffalos” (fried brussels sprouts with buffalo sauce and bleu cheese crumble) and “French onion queso fundido" — a pool of French onion confit with a layer of melted and browned Swiss, served with toasted bread. Two salads ($9 and $10) provide a respite from the richness (though one does feature bleu cheese crumble), and the Danny’s Devito, a plate of short rib over fried potatoes and broccoli rabe, serves as an entree ($15.) The short rib is also available in a smaller portion on a kids’ menu, along with gluten-free chicken tenders, grilled cheese fingers and mac and cheese. If you somehow still have room for dessert, Whey Station(ary) sells slices of NoRA Cupcake Company cakes and a butterscotch pudding with sea salt, whipped cream and Pecan Sandies crumble. THE BAR: Whey Station(ary) has 12 beers on draft, focusing on Connecticut-made brews and cider with a few regional and national selections (along with Paulaner, a German offering.) Recent local features include Fat Orange Cat of East Hampton, Two Roads of Stratford, 30 Mile of Old Saybrook, Relic of Plainville and Middletown’s own Spoke and Spy cider. Jillian says the beer-and-grilled cheese pairing was a natural one, as the truck is a fixture at state breweries and beer festivals. The bar also offers red, white, sparkling and rosé wines. LOCATION AND HOURS: Whey Station(ary) is at 544 Main St. in Middletown. It’s open Wednesday and Thursday, 11 a.m. to 9 p.m.; Friday and Saturday, 11 a.m. to 10 p.m.; and Sunday, 1 to 8 p.m. Closed Monday and Tuesday. 860-740-2403, wheystationary.com.